Convertible strollers are designed with moms in mind who do not want to have to buy a stroller for a baby then change it out once they are a toddler and again as a small child. The best convertible stroller will combine the features of different strollers into one so that the stroller will grow with your child. This adaptability allows your child the ultimate comfort that is tailored to their needs for their current stage of life. For instance, prams are optimal for new babies in that it allows them to lay back completely horizontally which allows them to sleep undisturbed while mom does her shopping or other running around. These prams are unsuitable for a longer-use stroller as they do not strap the infant in, and the baby can crawl out once they reach the crawling stage. Traditionally, this would mean purchasing a whole new stroller, and the pram would be set aside for the next child or sold. Many convertible strollers incorporate multiple stages in multiple seating arrangements. Strollers such as those labeled as Sit and Stand often have the capability of carrying not only an infant but also an older sibling or two in different fashions. Some have another seat while others have a board that they can stand on. This adaptability to your needs is what makes convertible strollers one of the most sought-after class of strollers on today’s market. While all of these strollers are adaptable, that does not mean that each stroller in this class is created equally in quality or options. With all of these options in mind if you are considering doing a little running or jogging you are better off with a dedicated jogging stroller. These options are what can make or break the convertible stroller in its suitability for your family. Options that are commonly available are extra seats, gliding boards, bassinets, and car seat adapters. Most of these options are not included in the base stroller kit and have to be purchased separately. While this can be expensive depending on how many accessories and the model you choose, ultimately they end up being less than purchasing a new stroller that is what would commonly be necessary with a non-convertible stroller. How many seats does the stroller have? What age and weight are the seat(s) designed for? What kind of wheels are on the stroller and what size? How easy is the stroller to clean? Can it fit in your car? How easy is it to convert? How easy is it to fold? This is important not only for the base model but also how many seats can this stroller accommodate? How many car seats can this hold? 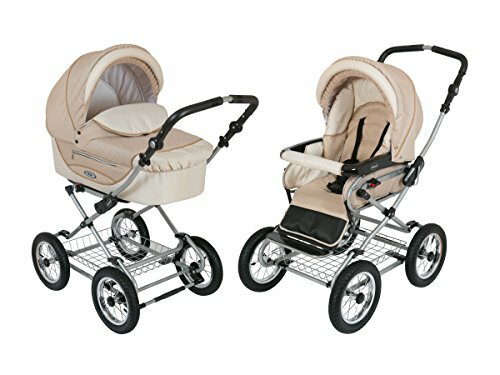 With the number of twins on the rise, many stroller manufacturers are taking this into consideration and therefore will offer options to allow for two infant car seats to be “plugged in” to the stroller so that the baby does not have to be woken up between the car and stroller and vice versa. This allows for a much more relaxing trip for mom and tot. You will also want to consider any siblings, current or future. When going shopping with a newborn and a 2-year-old it can be chaos trying to deal with a child in hand and one in the stroller. By having an optional second seat, this alleviates potential toddler meltdowns and gives you an extra hand free. What age and weight is the seat(s) designed for? This is very important as many strollers are designed for children who can sit up on their own and only go to 30 pounds. This makes them acceptable for the first year or two of the child’s life. However, as they have to be able to sit on their own, it cannot be used for the first 4-7 months of the baby’s life making it impractical for newborns. It also makes it impractical for children over 2-3 years old as they will be too heavy. Many convertible strollers offer alternatives to the toddler seat. They often have a toddler seat that is suitable for children between 10 and 50 pounds making it suitable for children up to age 6 or 7 and then offer alternatives for newborns. These alternatives can be in the form of a car seat adapter where the child can sit in the car seat instead of the stroller’s seat or can be in the form of a bassinet. This is why you should double check the age and weight requirements of the stroller you are looking at purchasing. A stroller’s wheels make a huge difference in how the stroller can be used. Rubber tires offer more grip than plastic wheels, and air-filled tires are more forgiving on uneven surfaces. When looking for a stroller for shopping or walking on smooth sidewalks there is less of a noticeable difference between wheel materials and sizes. However, as soon as you encounter rocks, uneven or slippery surfaces, or other obstructions you will instantly see the benefits of a rubberized tire. Strollers with large wheels offer a smoother ride that is better for different terrain and weather conditions such as snow, gravel, or even sand. Smaller wheels are often unsuitable for this type of terrain and should be used in smooth, urban conditions with minimal obstructions. Children are messy. There are no ifs, ands, or buts about it. Therefore, whether your baby’s diaper leaks or your toddler drops crumbs on the seat, you will eventually need to clean the stroller. Not all strollers are easy to clean and most, unfortunately, are spot clean only with mild soap and minimal water. Ideally, the cover should be removable so that you can easily throw the seat in the wash but this is not often the case with strollers. So make sure to check how to clean the stroller you are looking at and decide whether or not that is suitable for your needs. This is a huge issue with some strollers, and you need to double check that they have not changed over the years. For instance, a popular double stroller fit in the back of a Sunfire in their 2007 model, however, their 2012 model was 4 inches larger and could not fit. This can make or break a stroller’s usefulness as a stroller that does not fit in your car will limit where and how you can use your stroller. While umbrella strollers are an excellent alternative to your main stroller, your main stroller should be able to go with you wherever you go. Many of the double strollers on the market are incredibly long and make you feel like you are pushing a cart rather than a stroller. While the length does offer the passengers lots of room to move around, it does interfere when you are shopping or going through tight spaces as it can be very difficult to navigate tight corners. If you do plenty of travel through narrow walkways, it may be a good idea to find a stroller that is more compact. One of the main issues people seem to have over the years with convertible strollers is that they can be quite cumbersome to change either the position or the seating. This is not always the case with today’s convertible strollers, in fact, most are extremely easy to change, and seats can be added or removed within seconds. This is perfect for those who are not overly handy with tools or need to change seating frequently, and no-one will complain that it is too easy. Strollers can be quite complicated to fold, particularly those with removable seats as you occasionally have to remove the seat to fold the stroller. This can be time-consuming and difficult, particularly when you are dealing with more than one child. Many strollers offer a single-hand opening and closing system making them ideal for parents on the go. This is a massive improvement from the “Lift tab A while holding down button B and having your foot lift up on bar C.” By ensuring that the stroller is easy to fold and not too heavy, you are making your life that much easier. Just right for buzzing around with two children, the Graco Room for 2 Click Connect Stand and Ride Stroller offers front and rear seats that each hold a child up to 50 pounds. The front seat can recline to several different positions, including a fully flat position and has a 3-point harness to 5-point harness. Front seat also has a tray that pivots, making it easy to get your child in and out. The rear bench seat, designed for an older child, is padded for comfort and has a 3-point harness. Your children also have the choice to stand up on the platform while holding onto riding handles. Suitable for infants, this double stroller is compatible with all Graco Classic Connect and Click Connect infant car seats. The car seat latches securely into place on top of the front seat. This stroller also features a one-handed, locking fold too quickly and conveniently toss into your vehicle. This stroller also includes a parent tray with two cup holders and storage space for a phone, keys, or your wallet. The Graco LiteRider LX is one of the lightest strollers on the market at only 16 lbs. But despite this light weight, it is sturdy and strong enough to wheel around your child until they reach 50 lbs. This stroller has an abundance of great features as well. It has a 2-position reclining seat, so you can use it with your littlest ones, then lift the back when they can sit up on their own. There is also a convertible 3- and 5-point harness that can be altered to meet the needs of your child. There are trays for parents and the child, plus a storage area under the seat for purses, diaper bags, or groceries. You can also use it with any of Graco’s Click Connect Infant car seats. For travel, this lightweight stroller folds easily with one hand. 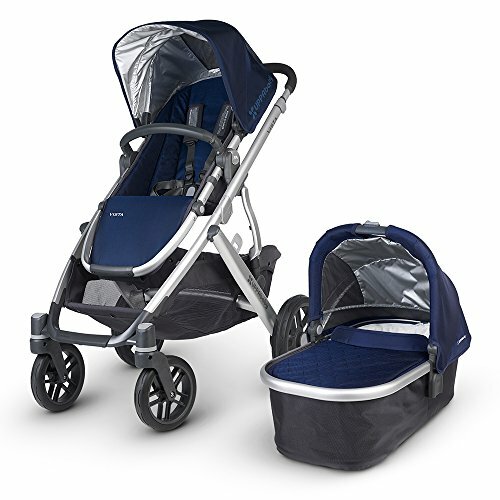 The Contours stroller features a lightweight aluminum frame, wheels that disconnect quickly and easily for storage, and a contoured handle. The Options Elite boasts a whopping seven different seating configurations, making it a good choice for families with two little ones of just about any ages. New to this model are a sandal-friendly brake, dynamic front, and rear-wheel suspension, and a lift-assist grip for seat dismount. When it’s folded up it can stand on its own, which would make it a good choice for maneuvering little ones around without having to lay the stroller on the ground. The stroller provides a smooth ride due to the front and rear-wheel suspension. The universal car seat adapter, purchased separately, is compatible with most of the infant seats available today. 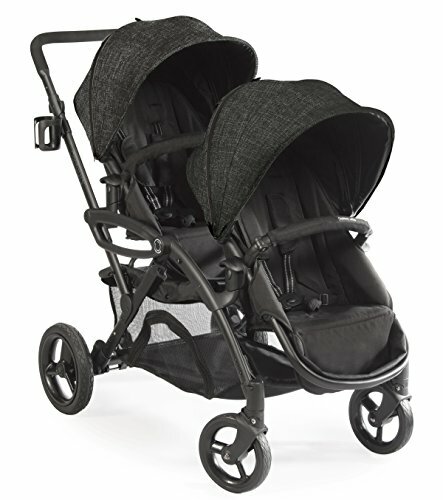 It can accommodate up to two infant car seats.This stroller is also an award winner! It has the distinction of receiving the 2016 National Parenting Award and the 2016 Cribsie Award. 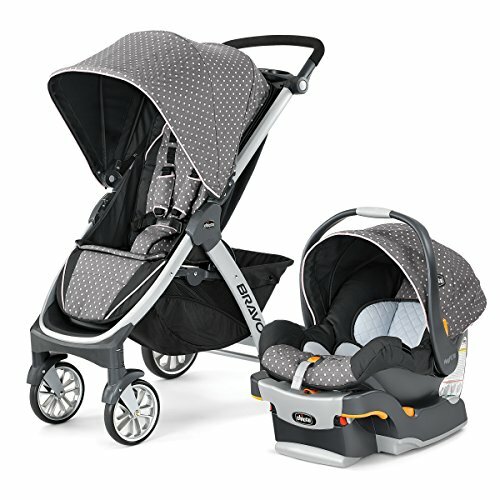 You can see a video of what the Contours Options Elite Tandem Stroller can do right here. The Baby Jogger City Select Stroller is well known for its ability to accommodate 1-3 children in comfort with over 16 configurations featuring any combination of front or rear facing toddler seats, infant car seats, bassinets, and/or glider board. This makes it ideal for families with twins or children of varying ages. The standard toddler seats can hold children up to 45 pounds safely with their 5-point harnesses. Little ones can nap in comfort with the reclining seats. This stroller is compatible with a variety of infant car seats with the use of adapters that can be purchased separately. It has a one-handed opening and folding feature, large rear air-filled tires, and an adjustable handle. The quick-fold technology allows the stroller to fold in one step. The rear tires are air-filled, giving it a smooth ride. There are a wide variety of accessories that you can purchase to customize this stroller for your family’s needs and desires. This stroller is almost completely customizable. See the City Select in action here. This Chicco innovative stroller can function in three modes. This travel system includes the Bravo stroller, KeyFit 30 Infant car seat, base, and adapter. In the first mode, the stroller works as an infant car seat carrier. You simply have to remove the stroller seat, put the adapter on, and click in the carrier. The KeyFit (infant carrier) can still be used with the stroller seat attached as well. This function would be good for the in-between times when baby still fits in the carrier but could also sit in the regular stroller seat. When your child has outgrown the KeyFit carrier altogether, the Bravo functions as a normal stroller. This handy system also features a reclining seat and an extra-large sunshade. It folds easily with one hand and stands upright with wheels that automatically turn inward. The handle can be adjusted for varying heights and the storage basket can hold the essentials. Weight Recommendations: Minimum-5 lbs., maximum-50 lbs. The UPPAbaby Vista stroller is usable as a pram, infant stroller, a toddler stroller or a mix of any of those depending on which seat(s) you use. This stroller system is very versatile, meaning it can be used right up through the first several years of baby’s life. The included bassinet can be used to transform this stroller into a pram. The bassinet has been approved for overnight sleeping which makes impromptu overnight trips easier because baby will be equipped with a bed. The toddler seat can be front or rear facing and is suitable for children up to 50 pounds. With the addition of a PiggyBack Ride Along Board, this stroller can accommodate three children comfortably in a variety of configurations making it ideal for singletons, twins, or children of varying ages. This stroller also comes with an insect and rain shield to ensure your child is protected from the elements and bugs while you are out and about. This stroller comes equipped with a large under seat basket that will easily hold a diaper bag along with any other items up to 30 pounds. The oversized foam filled rubber wheels provide grip and versatility when dealing with less than ideal terrain and, unlike air-filled tires, will never deflate. This, in combination with the front and rear suspension, provides superior comfort for any and all passengers. Watch a video of what the Uppababy can do here. Weight Recommendations: Minimum-4 lbs., maximum-50 lbs. 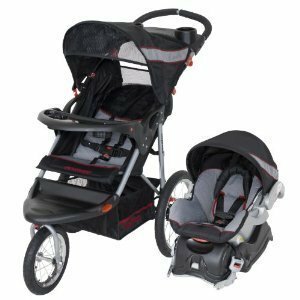 The Baby Trend Expedition Travel System comes with the Expedition Baby Trend 3 Wheel Jogging Stroller and the Baby Trend Flex Lock infant car seat with lock in car base. The car seat base is adjustable and includes a level to make sure baby is safe and secure. 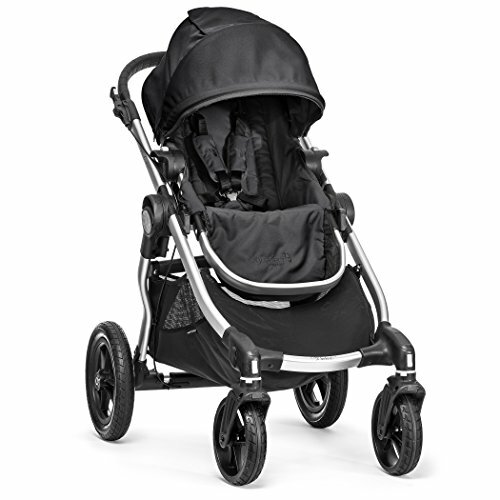 The stroller features a lockable front swivel wheel for jogging. The wheels have all-terrain tires and a quick release for compact storage. The stroller has both a parent tray and a child tray, in addition to a large storage basket. The wide handle is foam padded for comfort and the adjustable canopy ratchets to block the sun and wind. The multi-position reclining padded seat has an adjustable 5-point safety harness and tether strap. This Baby Trend folds easily and is lightweight. It can accommodate children up to 50 pounds and 42 inches tall. The Flex Lock 30 infant car seat is designed for babies weighing between 5 and 30 pounds and are no longer than 30 inches tall. Keep in mind that the jogging function of the stroller is for when your child is older and is in the stroller seat only. Check out a video of the Baby Trend here! Weight Recommendations: Car seat: minimum-5 lbs., maximum-30 lbs. ; stroller: maximum-50 lbs. This is one of the most unique strollers there is, mostly because it is not just a stroller. You can also convert it into a bicycle with a child seat on the front for easy and unique traveling. In bike mode, the child seat is located at the front, with the child facing forward. Then mom or dad sit behind them, pedaling their way through town. There is also a handy storage basket underneath for any gear you need. Then, when you need to walk but still want a stroller to push, you can convert this handy bike into a pushable stroller. The back bike wheel flips underneath to make a front stroller wheel that you can lock in place. The child seat is also padded and can hold a child up to 55 lbs, or about 5 years old. And it has a 5 point harness to keep your child extra safe. 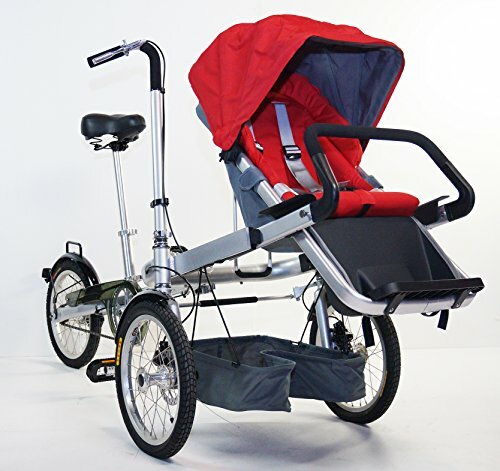 This Roan Kortina pram stroller is designed to be used from birth through three years. It has a classic look and provides a smooth ride with 12.5” air-filled tires. The unit includes chassis with wheels, bassinet, side cover, mattress, all-weather covering, adjustable hood, and a diaper bag. Keep in mind that the wheels don’t swivel. It has a parking brake and the backrest can adjust to three different positions. The bassinet can face forward or to the rear. The adjustable hood can be used with the bassinet or seat function. The roomy bassinet has handles and a five-point harness for safety. This stroller also has a large metal storage basket underneath. Buying a stroller is like buying a second (or third) car. While they may seem expensive at first glance, remember that these strollers are what you are trusting to keep your child safe and comfortable. They are designed to last from the time they are born to the time they are comfortable walking beside you instead of a single stage in your child’s life. By asking yourself questions such as whether the stroller is easy to fold or clean before you buy the stroller, the more likely you are to be happy with the one you choose. This will, in the end, make your stroller experiences significantly more enjoyable. It will also allow you to spend more time enjoying outings with your children than arguing with a stroller that just doesn’t quite meet your family’s needs. If you are looking for a different kind of stroller check out all of our best stroller guides. As always, only you will know what stroller will ultimately fit your family’s budget and requirements. This guide should help show you some options. If we were able to help you make a decision on buying the best convertible stroller for your needs please click through on one of the links and purchase it from Amazon. This site is part of the Amazon Affiliate Program and, at no extra cost to you, we will receive a commision from Amazon if you purchase your stroller through our site. Thank you for reading and have fun with your TinyTraveller.